';dic['GYROTONIC_CONTENT'] = 'What is Gyrotonic? The Gyrotonic Expansion System® is a new system for exercising the muscles and mobilising the joints, based on the method invented by Juliu Horvath. The system uses the principles of dance, yoga, tai-chi, swimming, and low-impact exercise to achieve well-functioning, integrated and interdependent muscle groups. We use various machines specifically designed to exercise the human body in a constructive way, ensuring freedom of movement and individual versatility. The movement is natural, with free, smooth spirals. There is constant conscious control of the joint movements. These are in general circular, so as to simulate the movements typical of both sport and everyday life, without altering the speed or effect. Every exercise is synchronised with a specific pattern of breathing. Particular attention is paid to developing the functional capabilities of the spinal column. This leads to better balance in the upper body, which is thus less subject to injury. Thanks to its versatility, the Gyrotonic Expansion System is currently used successfully throughout the worlds of dance, sport, and rehabilitation, for adults of all ages, to improve resistance, coordination and flexibility. It is also of extraordinary value for children and teenagers, for whom the exercises or particularly beneficial in such a key phase in their development. ';dic['PILATES_CONTENT'] = 'What is Pilates? Produce a "total harmony of movements" to create: a flat abdomen, a strong, flexible back, slim, well-toned thighs. Who is the method suitable for? Older people wishing to restore their body's flexibility, those in sedentary jobs looking for a way of reviving their muscles and joints, professionals aiming to achieve perfect fitness to optimise their working time, pregnant women looking for exercises to prepare physically and mentally for birth, those requiring practical results from personal training, teenagers trying to improve their posture, those undergoing physiotherapy, those on a diet seeking to improve muscle tone without muscle growth, professional or amateur sportsmen and women who wish to add a method to their training regime to improve their flexibility, and dancers wishing to prevent or recover from injuries. ';dic['PANCAFIT_CONTENT'] = ' What is Pancafit Metodo Raggi? 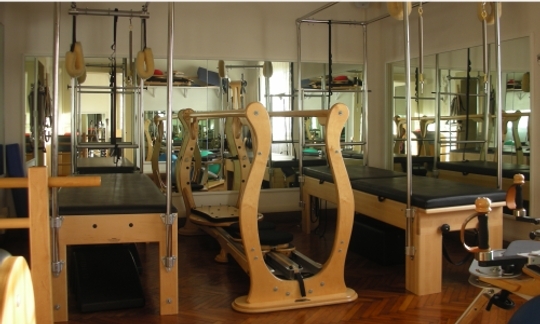 It is a simple piece of equipment composed of adjustable boards, using the “radial method” to achieve both active and passive postural alignment. It works by elongating all the muscles of the body to obtain a well-balanced body and correct posture. Success requires the equipment to be used in an appropriate way. To make the most of Pancafit, a series of precisely-defined exercises and techniques are taught by a suitably qualified teacher. The method differs from traditional muscle stretching exercises. Instead, specific exercises target the muscular, fascial and connective chains and release the breathing, with the result that blocked or painful joints are freed up, and their mobility and function restored. For those suffering disturbances of the spinal column (neck pain, back pain, scoliosis etc.) related to muscle tension, stress etc. For teenagers with poor posture as a result of carrying heavy rucksacks or the long hours spent sitting in school and doing homework. Older people who wish to remain active without overtiring or overstraining themselves. Those suffering from poor circulation. Special postures can be used to treat venous and lymphatic congestion effectively. Those wishing to improve their health by devoting a few minutes a day to a valuable, pleasant, and innovative anti-stress treatment. All sportsmen and women, because a good posture enables optimal muscles function thus improving performance, and reducing the risk of injury. Functional re-education is a form of exercise dealing with control of posture, coordination, mobility and muscle tone. It enables victims of accidents or illness to overcome the most painful and clinically significant effects. It is used to aid recovery from accidents, or to restore correct movement in those suffering orthopaedic, osteo-degenerative or rheumatic disease. The aim is to improve the health and well-being of the whole individual, via appropriate exercises to train the muscles and address the particular sources of discomfort. In some cases exercise machines are used, but for many exercises, simple equipment or no equipment at all is required. Functional re-education is appropriate for all who feel the need to restore their body's balance and harmony, who feel they are no longer in harmony with themselves, whether because of a specific physical condition (a bad back, neck pain, the effects of an injury) or for emotional reasons (stress, depression, insomnia). It is also suitable for athletes wishing to prevent the typical injuries of their specific sport, or to reduce the risk of further injury following an accident or surgery. discover our philosophy, learn about us. news: opened 12 months on 12!